Of the many things that dance can be about, what about the simple concept of feeling joyful in our own bodies? Alas, that's easier said than done. In many styles of dance, there is a centuries old expectation that female dancers be dainty, delicate and waif-like and male dancers should be masculine and powerful. But times are changing and perhaps it's time to change that expectation too. At 12 years old, KT Kusmaul was told by her ballet teacher "you're good enough to play the role, but I can't have you on stage in a tutu with legs that big." Those words, at that age, stick with you. Still, KT remained an avid dancer until age 20 at which point if you don't go the professional route, there becomes less and less opportunity to perform and stay involved. Her performance engagements drifted more towards drag, burlesque and gender performance, and in her career, she became a nurse. After many years of pushing through her own mental barriers of questioning 'who should be a dancer' and 'what is dance', she knew she wanted to get back into it, but taking any old dance class was tough. She feels that even classes that claim everybody is welcome, don't often work out that way. "It's hard be show up, let alone feel safe to dance, in a class where I have good reason to believe people are uncomfortable with or shocked by my size. I'm more than just a few pounds too fat to be taken seriously as a dancer, and I think it makes people uncomfortable. This is the culture that we grew up in. It's hard to separate ourselves from that." KT doesn't necessarily blame people for having this mindset, but rather she recognizes that people often hurt others in the way they've been hurt. Still, it's a mindset she's determined to move past, and she wanted to create a space that really is safe for fat bodies to dance, grow and reclaim joy within their own bodies. So she decided to start a fat-centric dance class, and see how it went. Originally in a space that could only hold 10 people, she immediately started maxing out the capacity. Currently she is in a space that can hold up to 24 and now offers classes in an 8 week series. These are also maxing out. "There is so much desire in the fat community for any fat-positive experience, not just dance." At least a third of the class has barely taken dance before. Another demographic is people who were dancers as kids, but were told they were too fat to dance. Just a year in, KT has undeniably built a solid community. In addition to weekly classes, she's coordinated a collaboration with another fat-centric dance group out of NYC. 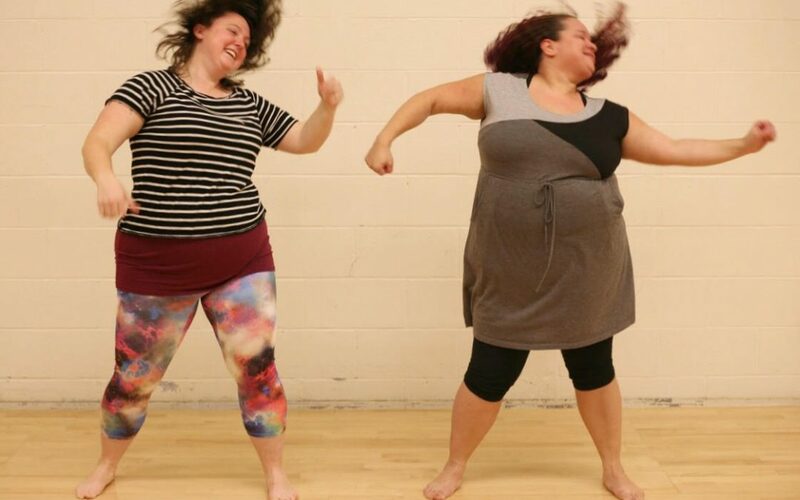 Fat Girls Dance is an online movement towards body positivity and self-love through the celebration of dance. Using her class setting, KT and Body Home created video that was then featured in the Fat Girls Dance weekly video drops. She explains how these videos had an impact on class. "Unsure how my dancers would feel about being on video, I soon realized that this collaboration gave a purpose for being vulnerable and helped create representation that others would benefit from. There was a double healing as dancers had to ask themselves, can I be brave enough to do this? and will that create representation for other people that is meaningful? Some of the best class attendance is on video days." Body Home also had their debut stage performance at a pop-up fashion show in Portland called Knock Out. This is a direction KT would like to move more into in the future - finding more opportunities to get out there and perform. For more info and to get involved yourself, check out their newly launched website! http://www.bodyhomefatdance.com In the mean time, consider re-examining your own perceptions of who can be a dancer. Doesn't everyone deserve to feel the joy of movement within the body that is their home?